Eric HOTZ - Paint Nite! I am a master artist for Paint Nite - Fraser Valley, British Columbia, Canada, and a full time professional artist. Join me at my Paint Nite events and unleash your creative spirit. 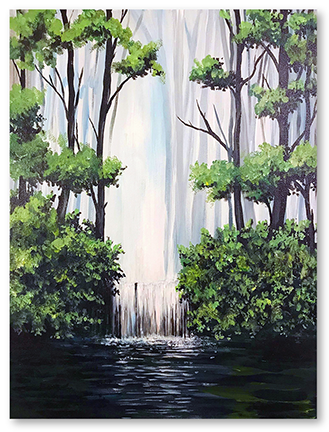 I provide quality paint brushes, paint, 16x20 inch canvases, aprons, a colour photo of the featured painting, step-by-step painting instructions, ​an assistant who will answer your questions and assist you with your painting, and great background music. Our venues are located in restaurants and pubs that serve great food and beverages. There are no limits or expectations — the night (or afternoon) is what you make it. NOTE: I use reusable plastic paint palettes at my Paint Nite events, not throw away styrofoam plates. This helps to make a better, more enjoyable painting event, while saving our planet one palette at a time. Duration: Paint Nite events are 2 - 2.5 hour events, although you may take more time if desired. We never rush you to complete your painting -- take your time! Photo of the Featured Painting: I provide everyone with a photograph of the painting to use as a guide. This can be used to help you create a better painting. Hair Dryers: I have a drying station set up at my Paint Nite events equipped with 2 hair dryers to allow you to quick dry your paintings rather than having wait for the paint to air dry. This allows you get get more painting done on your works of art. I provide colour photos of the painting to better help you create your painting!